Does the nationality of the aircraft registration matter? The Isle of Man do it differently! Most aircraft are flying internationally and many non-EU operators are using the Temporary Admission procedure when they are flying in the EU. The basic simplified rules are that an aircraft owned/operated/registered/based outside the EU, can use the Temporary Admission procedure. There has been an on-going discussion for years in the aviation society about whether or not the 28 EU aircraft registrations can be used with the Temporary Admission procedure. Special focus has been on the Guernsey (2) and Isle of Man (M) registrations as both these jurisdictions are outside the EU but inside the EU customs territory. We have therefore commissioned another verification survey about this subject. The nationality of the aircraft registration is extremely relevant to look at in this context. 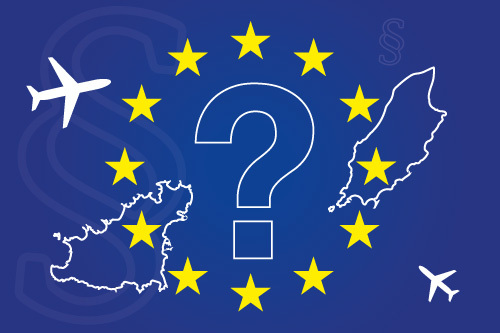 In our opinion there is no doubt that the 28 EU aircraft registrations, the Guernsey (2) and Isle of Man (M) registrations cannot be used combined with the Temporary Admission procedure. The important article 212 (a) in the EU customs code (Commission Delegated Regulation No 2015/2446) about the conditions for granting total relief from import duty for means of transport mentions the following “they (the aircraft) are registered outside the customs territory of the Union in the name of a person established outside that territory”. This should leave no doubt. The feed-back is unanimous and the result is that the mentioned EU aircraft registrations cannot be used in combination with the Temporary Admission procedure. This also means that an Isle of Man or Guernsey registered aircraft based e.g. in the Middle East or Hong Kong is basically not allowed a single entry into the EU if the Temporary Admission procedure is used. The risk is that local customs will asked for a full importation to be completed with a full payment of the VAT. What kind of aircraft registration will local customs accept for use under the TA procedure? 1) Both jurisdictions are outside the EU but inside the EU customs area. Even though the above result is unanimous, it is common knowledge at least within the aviation society that Isle of Man customs for years have accepted that their own M-registered aircraft could be used combined with the Temporary Admission procedure. It is unknown to us under which circumstances and legal references such a combination can be legal and aligned to the EU Customs Code and guidelines from the HMRC.